There is no Read/Reference in our textbook for household chemicals. If you go to Blackboard’s Course Content, there is a folder at the bottom which contains the power points for another Pierson Liberal Arts Chemistry textbook: Chemistry for a Change Time (Hill). 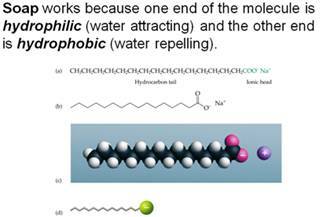 Look at Power Point for Chapter 20 (Household Chemicals). 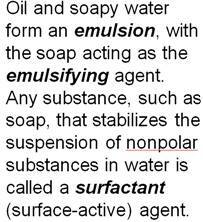 The description of synthetic detergents as the first big change in soap making in two millennia was hardly an exaggeration. 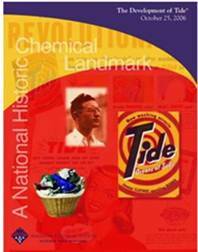 Tide, the first heavy-duty synthetic detergent, was not just a new product, but a new kind of product. 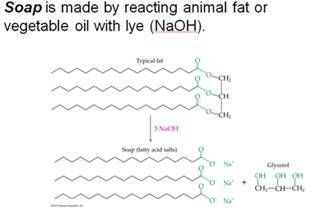 It was based on synthetic compounds rather than natural products. 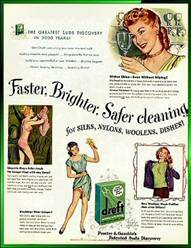 Although initially targeted for marketing in areas of hard water, synthetic detergents—with Tide® in the lead—soon displaced traditional soaps throughout the United States. There is a lot of chemistry in something so simple as a bar of soap. But think of kids playing in a bathtub. After you drain the tub, there is a soap ring or scum around the tub. So our Jacksonville water is “hard” (contains calcium, magnesium, and iron ions). Now to wash clothes you have a chemistry problem. Over half of the detergent you use at $6 a pound softens the water (making it milky color) and half is used to dissolve the oils and other organic materials which water will not dissolve. Next chemical product on the grocery store shelf: Washing soda, which is (Na2CO3 . 10 H2O) and trisodium phosphate (TSP = Na3PO4) and it will raise the pH of water and precipitate calcium, magnesium, and iron ions. You now, if you wash clothes, you are a solution chemist! 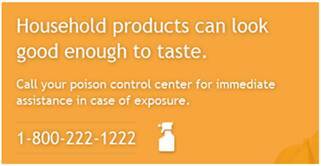 With so many chemicals in your home, it is easy for a product to be misused, especially when small children are around. On the label of each household product there is a precaution and instruction on what to do if there is misuse. 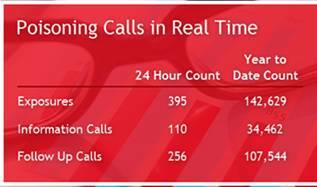 However, if there is no warning on the label or if you really want to talk to someone, there is a 24 hour hot line provided by the Poison Control Center. Here are the Jacksonville Locations! 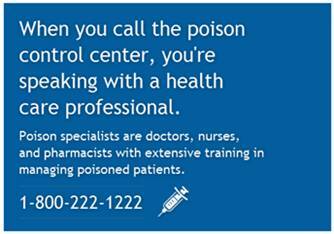 More than two million poisonings are reported each year to the 57 poison control centers across the country. 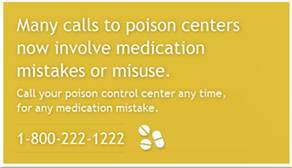 More than 90 percent of these poisonings occur in the home. 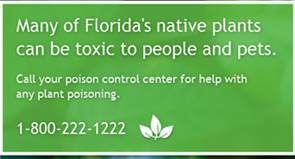 The majority of non-fatal poisonings occur in children younger than six years old. Read label directions for proper storage and disposal instructions. Store products out of reach and out of sight from children. Keep products in their original containers, with the label so products can be easily identified and label directions can be read. Talk with your children about what is safe to taste and what is not safe to taste. For example, colored liquids may look like juice, so teach your children to ask an adult before they try something. Which Can I Taste? game that asks kids to choose between photos of two similar looking items for which one is safe to taste. Examples include: difference between glass cleaner and blue Gatorade; Mountain Dew and yellow cleaning supplies; candy and vitamins. The idea is that the pictures will look so similar some children may guess the “safe to taste” item wrong, teaching that it’s important to ask an adult before tasting and to keep items in their original containers. Safe to Taste Collages activity allows children to use magazines and newspapers to select photos for a collage that illustrate what is safe to taste on one side and what is not safe to taste on the other. 1. The student will collect data from 5 different categories of household products used in her/his home. The student will read the label, classify the product as one of the 47 categories above, and then copy the label on the Project 20 Household Chemical List. 2. The product and its chemical contents should be listed first in your Project 20 Household Chemical List. 4. You will submit your list for credit as an attachment to an email to your instructor as well as post your finding in Blackboard’s Course Tools as a Journal. 5. 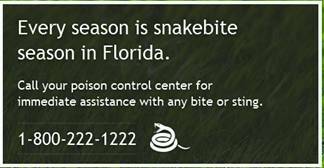 Post near your telephone a sign which includes the Poison Control Emergency Number. Also put this number in your cell phone.